For people who is looking to add a Blu-ray burning tool to Windows 7 operating system, the 7Burn burning software is one of the many choice available. 7Burn is a CD/DVD and Blu-ray burning tool which has been designed to work properly under Windows 7 through IMAPIv2. Besides as a burning tool, 7Burn also supports ISO image burning and able to erase rewritable disks. 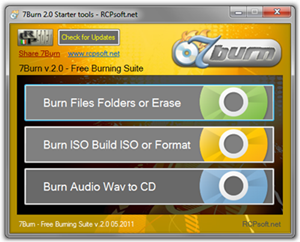 To make the program simple to use, the main interface of the 7Burn has been created with three options for users to choose such as “Burn Files Folders or Erase”, “Burn ISO Build ISO or Format” and “Burn Audio Wav to CD”. The 7Burn supports most of the popular writable discs including CD-R, CD-RW, DVD ROM, DVD-RDVD-RAM, DVD+R, DVD+RW, DVD+R Dual Layer, DVD-RW, DVD-RW Sequential, DVD-R DL Sequential, DVD-R Dual Layer, DVD+RW DL, HD DVD-ROM, HD DVD-R, HD DVD-RAM, Blu-ray DVD (BD-ROM), Blu-ray media Sequential, Blu-ray media, Blu-ray Rewritable media. 7Burn is available as a free download in two versions, a portable which does not require installation and a Windows installer version for installing onto Windows PC from sourceforge.net. Note: If your systems is not supporting IMAPIv2, then you can update through (only applicable to legacy Windows XP and Windows Server 2003 which has been not updated with service pack).